Now available all over the place! 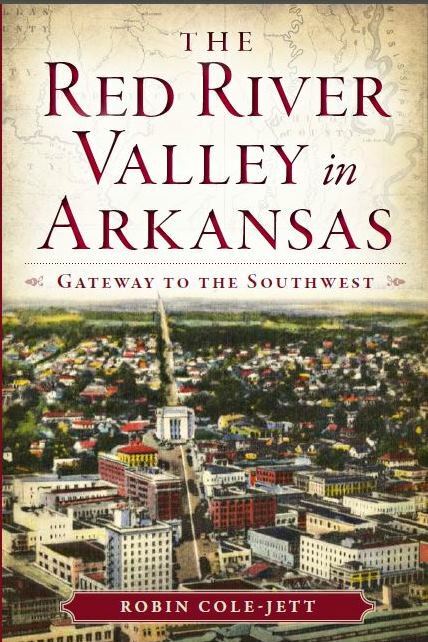 I am not one for bragging, but when I opened the box that contained my author’s copies of my newest book, The Red River Valley in Arkansas: Gateway to the Southwest, I had to admit that the cover NAILED it. It is so, so pretty! “The Red River’s dramatic bend in southwestern Arkansas is the most distinctive characteristic along its 1,300 miles of eastern flow through plains, prairies and swamplands. This stretch of river valley has defined the culture, commerce and history of the region since the prehistoric days of Caddo inhabitants. Centuries later, as the plantation South gave way to westward expansion, people found refuge and adventure along the area’s trading paths, military roads, riverbanks, rail lines and highways. This rich heritage is why the Red River in Arkansas remains a true gateway to the Southwest. Author Robin Cole-Jett deftly navigates the history and legacy of one of the Natural State’s most precious resources.” I blush. Check out my other books, too: Traveling History with Bonnie & Clyde, Traveling History up the Cattle Trails, and Images of America: Lewisville. I started my website WAY back in 2002 as a way to share my love of regional history with like-minded people. It’s become a really fun conduit to share information, photos, and discoveries. I now keep up with many readers through my Facebook page, too.